High cholesterol does not come without some serious consequences. One of the most dangerous is a condition called atherosclerosis. This is a process that occurs over time and results in a build-up of plaque within the mid-sized to large arteries. When the build-up becomes significant, it limits blood flow which reduces oxygen distribution throughout the body. When there is less oxygen to the heart it can lead to a full-blown heart attack. Another serious result of atherosclerosis is that the artery walls can become so clogged with plaque that they are completely blocked. When this happens, so does a stroke. So, what is it that causes all this plaque build-up? The main cause of plaque build-up begins first with a weakening of the artery wall. There are three factors that lead to damage and weakness in the arteries. They include high cholesterol levels and triglycerides (fats) in the blood, high blood pressure, and cigarette smoke. In technical terms the build up within the arteries is a plaque that is made up of several substances: cholesterol; calcium; fibrin which is a blood clotting substance; and other cellular waste. Most people as they age will experience some degree of hardening of the arteries known as arteriosclerosis. This is not to be confused with the condition of atherosclerosis, which is a weakening of the interior wall of the artery caused by long time high cholesterol levels. It may take years and years for the disease of atherosclerosis to cause a stroke or heart attack, but there are steps to preventing high cholesterol from leading to such results. A low cholesterol diet that includes specific vitamins, minerals, and herbs can reverse high cholesterol and its damaging impact on the arteries. 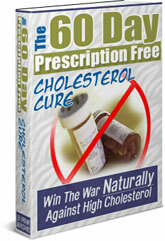 You can do it, even without the use of prescription drugs with The 60 Day Prescription Free Cholesterol Cure.